Didn't know whether to put them in QLD or NT so as a QLD'er I made an executive decision! 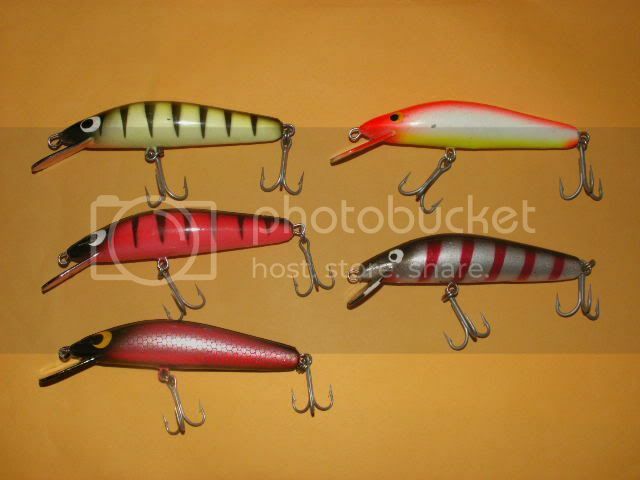 These are the first "mass produced" lures Jeff did. Do they have metal bibs Jenkins ? The bibs are plastic Tagged, the same material as the body. These are the ones that broke easily, are they ? So then the steel bibs are younger than these. I'm not 100% sure on the time line of these lures Tagged, but I think this was Reidys first attempt at mass producing moulded lures, so these are probably older than the steel bibbed lures.Jenkins would know more about it. I was told these are the oldest moulded lure in australia. I dont know where Bellbrooks were made so not sure if they were first or not. Thanks Goodoo and Jenkins, it's always great to learn more about a lures history. I'd really like to have an idea about the progression in how the name "Reidys" is printed differently on many of the lures. For instance there is five different styles of writing just in the ones I have posted above (plus those without the name) and I'm sure there are more. So as it stands Reidys are Territory lures, some people arent executive material allegedly. Reidy's belong in two states, Qld and NT, along with JaySea. I don`t know, you Qlder`s just can`t let things go can you`s. siegfried wrote: I don`t know, you Qlder`s just can`t let things go can you`s. Now why would you say that Siegfried? All I have to do now is find the time to pore through 30 years of magazines to figure out what's what in the Reidys State of Origin Challenge! I like those lures. They gave me a pretty great idea. I'll post them here in a bit.